Snoring is the sound that is caused when the tissues at the back of the throat or tongue is relaxed and come in to contact with each other causing a blockage. The snoring sound is caused by air forcing its way past the blockage. What are the Benefits of Using an Anti-Snoring Mouthpiece? A better night's sleep for you and your partner. You will feel more alert and awake during the day. Importantly you will avoid the health risks that accompany long term snoring. What is a MAD or Mandibular Adjustment Device? A MAD is a device that you place in your mouth before you go to sleep. There are several different designs of MAD but they all work in a similar fashion. The device is placed between your upper and lower teeth. In doing so the lower jaw is positioned slightly forward of the upper jaw. What this does is to pull the tongue slightly forward and leave the airway more open and less restricted. 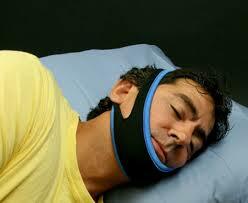 They are very effective at eliminating snoring in about 85% of cases. What is a TSD or Tongue Stabilizing Device? A TSD is a small device that, using suction, sticks on to the tip of your tongue. There a flange on the TSD that is placed against the outside of your mouth. This causes the tongue to be pulled forward leaving the throat less restricted in a similar way to the MAD. Although less common than the MAD, a TSD can be used in circumstances where a MAD cannot be used, such a people with dentures. To use a TSD you need to be able to breathe through your nose when asleep. Are There Any Side Effects from Using Anti-Snoring Mouthpieces? No, but they can sometimes take a week or so for you to get used to them. While you are getting used to MADs you may notice excessive salivation or a slight soreness in the jaw. With TSDs a soreness on the tip of the tongue may be experienced as well as some excessive salivation. For both devices these effects usually disappear within a week of starting using the devices. Can Anti-Snoring Devices be used with Dentures? If you wear dentures the devices that are generally most suitable are TSDs. This is because they are held in place by the outside of the mouth rather than the teeth. As a rule MADs are generally not recommended for use when wearing dentures due to the fact that the MAD uses the teeth to hold the device and jaw position in place. There are some MADs that are advertised as being suitable for denture wearers but these are the exception and have stipulations, so check before you buy. How long do Anti-Snoring Devices Take to Work? Both MADs and TSDs can be effective immediately. The can take a little time to get used to so the effectiveness may take a few days before it becomes really noticeable. Do Anti-Snoring Devices Cure Snoring? No, what they do is stop snoring. Does Long Term Snoring Affect Your Health? Can You Breathe through Your Mouth with a Mouthpiece Fitted? With some MADs, those with an air hole, you can breathe through your mouth with them fitted. With other MADs or all TSDs you need to breathe through your nose. If you have one of these nose breathing devices you need to be able to adequately breathe through your nose when using it. It you develop a blocked nose for example an allergy, you need to stop using these devices until the reason for the blockage has gone. Are Anti-Snoring Mouthpieces Available Without a Prescription? Although most mouthpieces available are classed as a FDA Class II medical device, which need a prescription, there is a way that they can legitimately be sold without one. By complying with Federal Regulation Code, as long as the supplier ''¦ gives adequate directions for use '¦' it is legal for them to be sold without prescription. What is the Difference Between a $10 Mouthpiece and $100 Mouthpiece? There are hundreds of very cheap devices advertised on the internet. Most of them do not list the contents of the mouthpiece (although some claim to). Often these are made using inferior non-medical grade components. You should think very long and hard as to whether you want to have something in your mouth all night without really being aware what the material is and whether the risk is worth a few dollars. Can Anti-Snoring Mouthpieces Benefit People with OSA? If you have been professionally diagnosed with mild to moderate obstructive sleep apnea, medical trials have shown that anti-snoring devices can help. With severe OSA or the less well known Central Sleep Apnea you should not use anti-snoring mouthpieces. Some MADs Have a Boil & Bite Fitting, What Does This Mean? Some MAD designs wok better when they are fitted to your individual mouth. The most common way of achieving this fit is through what is known as boil & bite. Typically the mouthpiece is placed in boiling water for about 20 seconds. It then, when cool enough, is put in the mouth bitten down on and then the mouthpiece is pressed to fit to the teeth contours. Then the mouthpiece is cooled completely in cold water. This tailors that mouthpiece to you. The boil & bite can be carried out 2 to 3 times to get the best fit. Individual instructions vary from mouthpiece to mouthpiece manufacturer so check the instructions for your particular mouthpiece. What if My Mouthpiece Doesn't Work for Me? Although anti-snoring devices are very effective at stopping snoring there are some cases that will be unsuccessful when using them. Most manufacturers accept this and many of them offer a money back satisfaction guarantee, or in some cases you only pay the shipping charge and then pay the full amount in 30 days only if you are satisfied with the product. These are ways that you can find out the effectiveness and are not out of pocket (apart from a small shipping charge) if that mouthpiece does not work for you.